The Alibaba IPO value saw another bullish estimate yesterday (Monday), when Piper Jaffray analyst Gene Munster projected that the Chinese e-commerce giant is worth $221 billion, including cash. Before yesterday's update, many analysts had settled on an estimate of $168 billion for Alibaba's valuation. That total was based on similar projections that have Alibaba raising between $15 billion and $20 billion in its initial public offering later this year. If Alibaba can raise $20 billion, it will be the largest U.S. IPO in history, eclipsing the $19.65 billion Visa Inc. (NYSE: V) raised in 2008, and the $18 billion General Motors Co. (NYSE: GM) raised in 2010. 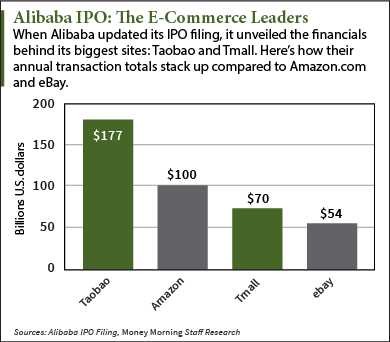 "An offering of this size would give Alibaba a $168 billion market cap – making it smaller than Apple Inc. (Nasdaq: AAPL) and Google (Nasdaq: GOOG, GOOGL), but larger than Facebook, Amazon.com Inc. (Nasdaq: AMZN), and eBay Inc. (Nasdaq: EBAY)," Money Morning's Executive Editor Bill Patalon said. 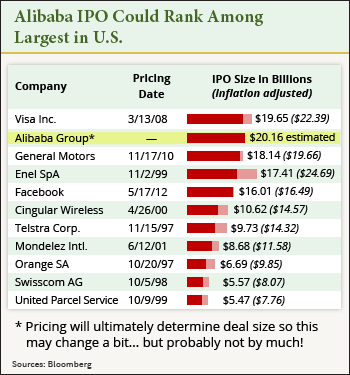 The Piper Jaffray estimate is the latest in a string of bullish projections for the Alibaba IPO. Last week, the investment research firm Morningstar estimated that Alibaba could raise an incredible $26 billion in its IPO. Before that, financial research company Sanford C. Bernstein estimated Alibaba's value at $230 billion. When Alibaba officials filed their IPO prospectus in May, the company reported having $5.66 billion in revenue and $2.85 billion in net income for the nine months ending Dec. 31. Alibaba also noted that its network of sites handles 80% of all online retail sales in China. In 2013, its most popular site, Taobao, handled $177 billion in transactions. Approximately $70 billion exchanged hands over Alibaba's second largest site, Tmall, during the same time. For perspective, Amazon.com Inc. (Nasdaq: AMZN) handled $100 million and eBay Inc. (Nasdaq: EBAY) handled $54 billion.